These mink fur scrunchies are made with real mink fur and have an elastic band inside. They come both in darker natural-looking colors (shades of brown) as well as in wild colors (red, blue, green, assorted colors, etc.). Please specify a color preference when ordering. For care instructions, click HERE. We also have fox fur and raccoon fur scrunchies. Genus and species for Raccoon: Procyon lotor. Wild. 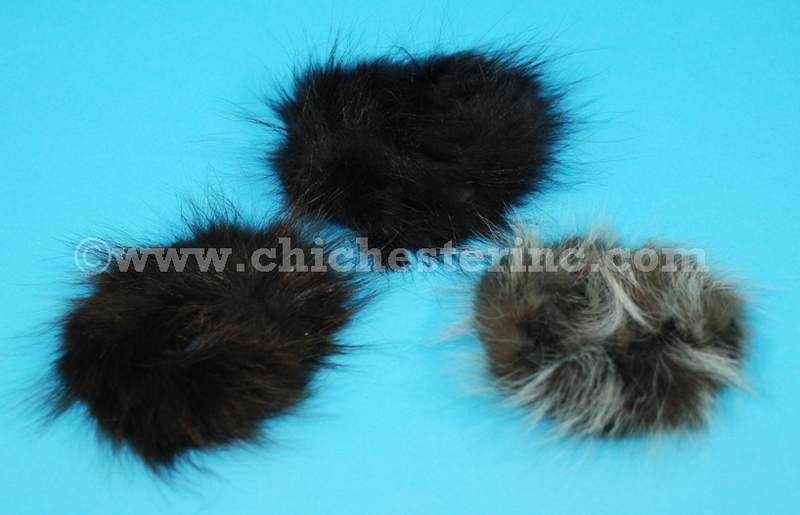 We also carry a different line of mink fur scrunchies made with real mink fur in China. They come in a range of colors (see below). Please note that we are currently sold out in all solid colors. We have the following colors mixed with black: tan, brown, white, yellow, red, green, purple, peach, orange, and multi-color. Please specify if you have a color preference when ordering. For care instructions, click HERE. These scrunchies are about 4.5" (11.4 cm) in diameter. The Fox Fur Scrunchies are about 6" (15 cm) in diameter. These scrunchies are about 3" (7.5 cm) in diameter.